Happy New Year from Leather Supreme! Hi everyone, Bill here! I’ve been letting Kerry, aka Leather Babe write most of my blog post these days. But I wanted to personally wish all my customers a Happy New Year! 2018 has been a good year and I really appreciate all the sales my customers have given us. 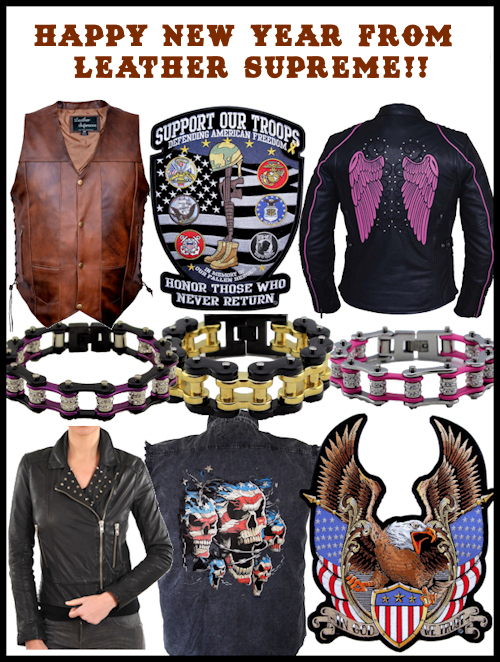 I still have a lot of cool biker products to add to the store, it just takes a long time! I’m happy with the new look and layout of the store. Kerry recently moved to Massachusetts (she’s a big Pats fan!) and is doing well. She still works with me as these days you can live anywhere and still work online, since most of her job is adding products, writing articles and so on. Continue reading Happy New Year from Leather Supreme!